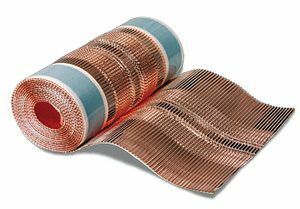 Hip and ridge ventilation roll made of solid, continuously corrugated copper with butyl adhesive strips can be used under the ridges and hips when using copper ridge and hip roll. This allows the roof to breathe and stops water ingress. © Solerati 2018 - All Rights Reserved.